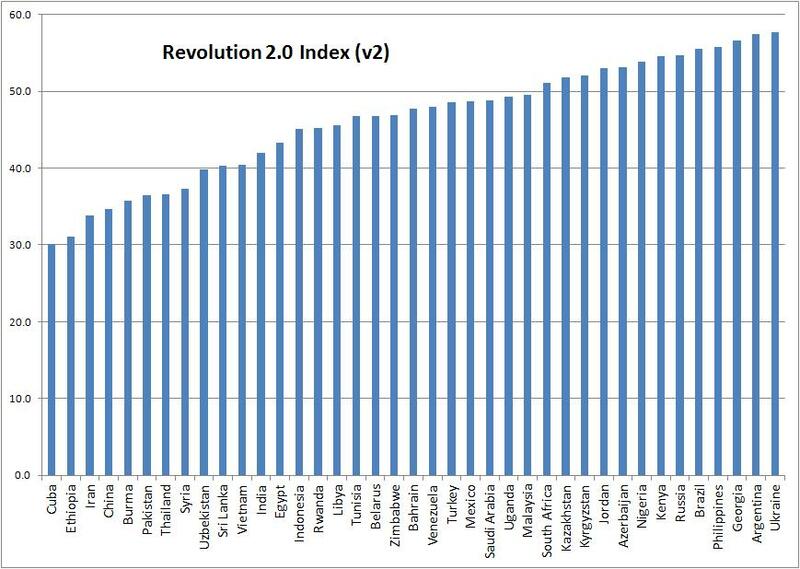 The Revolution 2.0 Index: Where Will The Next “Arab Spring” Occur? In Networks of Outrage and Hope (NOH), Manuel Castells demonstrates the centrality of ICTs in the initiation, growth and mobilisation of recent mass protests: the Arab Spring, Iceland’s Kitchenware Revolution, the US Occupy Movement, and Spain’s Indignadas. A central assertion is that cyberspace is a place of safety and autonomy for mass social movements, including those that grow into revolutions. Looking worldwide, though, that clearly isn’t true – try organising your revolution online in China, for example, and see how far you get. But that’s just a measure of constraint. Revolutions are driven forward by outrage. As Castells points out, in the case of the Arab Spring, outrage had built up as earlier protests and alternative options were repressed by the state. Therefore the driver to protest may be measured politically. An example would be the Economist’s Democracy Index, though reversed into an “Outrage Index” so that higher scores mean more autocracy and repression, which could trigger more protest. 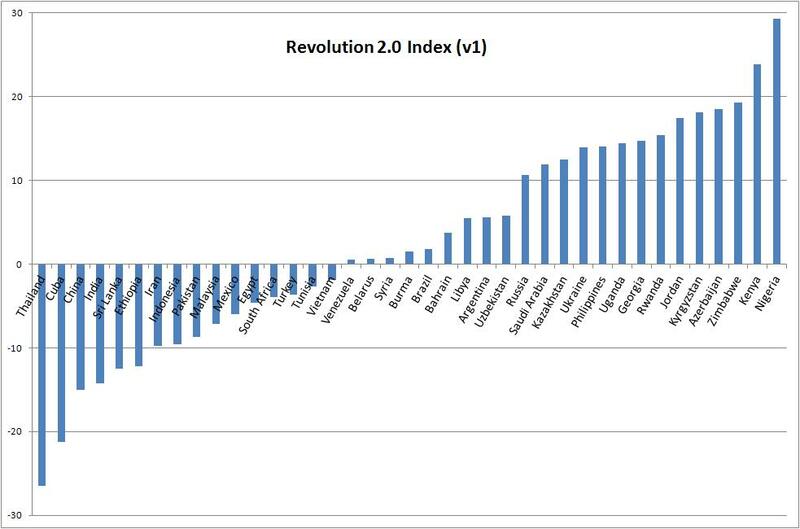 My first pass at a Revolution 2.0 Index (see chart below) is each country’s Outrage score minus its e-Control score. A low overall score might derive from a country being relatively democratic, creating limited head of steam for regime change (e.g. India) or because cyberspace is so controlled (e.g. Cuba, China). Conversely, high scores typically arise in countries where political freedoms are compromised but Internet freedoms are not (yet). Hmmm . . . there’s a lot that’s cronky here: for example, this version of the Index has clearly not studied the recent history of Thai politics. i.Taking account of ICT access rates, which would for instance push some of the African countries down the rankings. The version 2 diagram below does this, using the ITU’s ICT Development Index. It then makes up the revised Revolution 2.0 Index from: one-half Net Freedom scores (though flipped so higher means more net freedom); one-quarter Outrage scores; one-quarter ITU scores. Is that an improvement? ii. Castells argues the mass protests have almost all had an economic foundation. We could try to measure that in terms of GDP per capita, but that’s not much of a guide: all the examples he identifies are from mid- or high-income countries. Or we could use the GINI measure of income inequality but checking that doesn’t show much correlation. Unemployment rates (especially among graduates) or changes in income levels or prices (e.g. of staples like bread) might be better measures to use. But there are some more foundational problems. These could be in the statistics e.g. the component parts of the indexes; the different distribution patterns of scores within the indexes; the arbitrary weighting of the indexes within the Revolution 2.0 Index. – For net freedom there might be a threshold effect e.g. that in countries scoring above, say, 70 there is not enough autonomy for a Revolution 2.0; whereas for those below there is enough and it is not particularly affected by variations in level of control. So instead of a continuum we might only have a two-state model: either there is online autonomy or there is not. – There’s no accounting for circumvention of net controls including use of non-ICT communication. – There is no simple relation between political freedom and mass protest. Spain and Iceland score well on political freedoms but both had a form of protest-induced regime change. Moving to more repressive regimes, one sometimes sees more protest, but in highly-repressive regimes, protest can become less likely. Protest and repression are also interlinked and change over time, the one feeding the other. – Emotional effects: Castells argues that the key elements to enrolment and mobilisation are not rational and quantitative: they are fear, outrage, enthusiasm, hope. Which don’t appear in common national surveys. – Institutional and cultural factors, including history, are hard to quantify, but have been shown to mediate the relationship between polity and protest. In sum, my sub-title was (c)heeky: the Revolution 2.0 Index will not identify the location for the next ICT-enabled regime change. However, there is still a sound central point – that there are significant national differences in both the drivers to mass political protest, and the ability of such protest movements to freely organise themselves online. Both of these combine to give us some sense of how likely “mass protest movements of the internet age” are to form in any given country. Above all, the Revolution 2.0 Index may be useful in triggering discussion e.g. in class: about the value of its construction, about what it misses out, about its ranking of countries (will Iran bear out its low placing during and after the 2013 elections?). 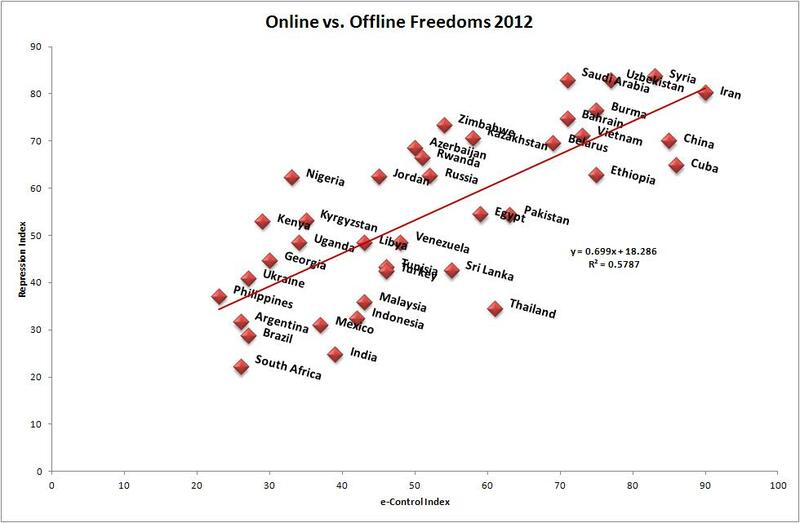 For example, the first version suggests there is no particularly neat relation between offline and online freedoms. That thought is developed via the following plot (of the flipped Democracy Index (here labelled ‘Repression’ rather than ‘Outrage’) vs. the e-Control (i.e. Freedom on the Net) Index). What does that tell us about e-politics? Nigeria and Thailand both have combined scores just over 90: how do they differ, and where would you rather be as a modern-day political activist? You are welcome to propose further alterations or to point out better existing measures. You can also mess around with the data, which can be found here: Revolution 2 Index Data. The countries picked in this discussion are just those developing/transitional countries which appear in the 2012 Freedom on the Net report. With acknowledgement to Wagner Kamakura of Duke University for supplying the ability, which Microsoft can’t, to label a scatterplot.